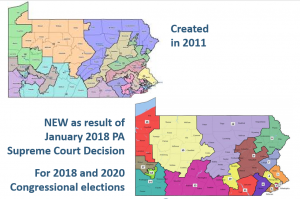 Presentation from AAUW-PA state conference April 13-15, 2018 — Gerrymandering Taking Away Our Voice. Every ten years, after the federal census, the districts for state House and Senate and Congressional (U.S. House of Representatives) are redrawn. Often this process or the results are referred to as gerrymandering. The term “gerrymandering” refers to the practice of dividing a geographic area into representative districts in a way that gives political advantage to one party or group in an election. It is widely published that Pennsylvania is one of the most gerrymandered states in the union. Consequences of gerrymandering are: many districts are no longer competitive; a growing number of candidates run unopposed; voters feel their votes don’t count; and the gridlock in Harrisburg and Washington D.C. gets worse. Gerrymandering is done equally by both major political parties. As a matter of fact, the partisan ads and appeals for money have already started. Advantage 2020 is the Democratic redistricting campaign and REDMAP 2020 is the Republican’s. These are partisan groups and both are positioning themselves to strike in Pennsylvania because our current laws make us just as vulnerable as in 2010. 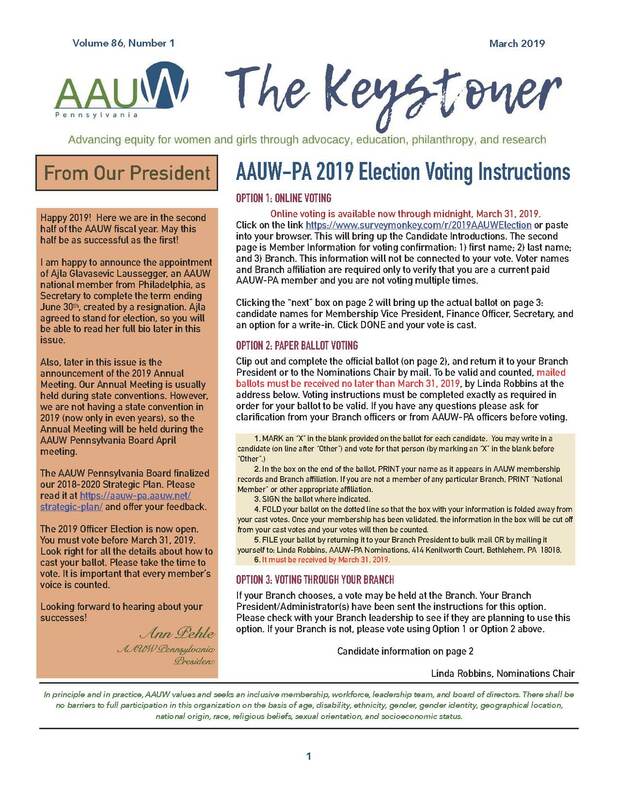 AAUW-PA is working on nonpartisan proposals. Redistricting reform is required if we want the districts to be drawn more fairly after the 2020 census. Pennsylvania’s constitution outlines how Pennsylvania House and Senate districts are drawn. Five-member redistricting commission of the majority and minority leaders of the Pennsylvania House and Senate and a fifth member, selected by the four, to serve as the commission chair. If the four cannot agree, then the Pennsylvania Supreme Court appoints a chair. The commission has exclusive authority to draw the maps. The legislature does not vote on the plans and the governor has no power to sign or veto them. Any resident may appeal the plans. Appeals go straight to the Pennsylvania Supreme Court. There is nothing in Pennsylvania law that mandates how U.S. Congressional Districts should be redrawn or what criteria should be applied to creating district boundaries. Currently, redistricting is done through the regular legislative process– a bill defining the Congressional district boundaries is passed by both the House and Senate and signed by the governor. Although the process is potentially bipartisan, if one party controls both the Pennsylvania House and Senate and the governorship, that party has exclusive control over how the district boundaries are drawn. Indeed, this is what happened in the 2012 redistricting process following the 2010 census. Pennsylvania’s Congressional districts were so contorted, most national discussions of gerrymandered congressional districts include examples from Pennsylvania. On January 22, 2018, the Pennsylvania Supreme Court found that our Congressional district map “clearly, plainly and palpably violates the Constitution of the Commonwealth of Pennsylvania.” The Congressional districts were redrawn and will be used for the 2018 and 2020 Congressional elections. A constitutional amendment is required to change the process for how Pennsylvania House and Senate districts are drawn. Changing a Pennsylvania constitutional amendment requires two legislative sessions. A constitutional amendment must be introduced by legislators and bills of identical language be approved in two successive legislative sessions, then ratified by citizens in a referendum. To impact the 2020 census redrawing process, legislation must pass in the 2017-2018 and 2019-2020 sessions and be approved by the voters no later than the November 3, 2020 election. In October 2016, AAUW Pennsylvania became an endorsing organization of Fair Districts PA. A project of the League of Women Voters of Pennsylvania, Fair Districts PA is a coalition of citizens and organizations who believe that in American democracy, elections should represent the will of all the people, not just the politicians, and should provide citizens with meaningful choices in electing representatives. 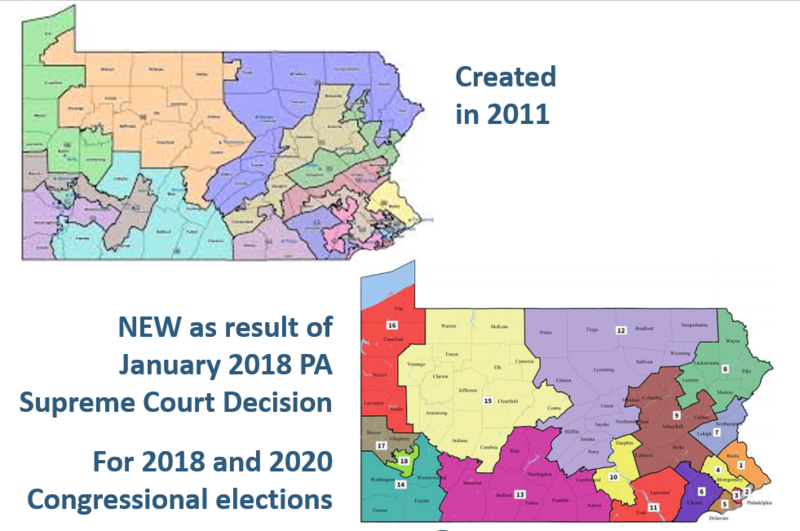 In March 2017, AAUW Pennsylvania became an endorser of Draw the Lines PA, a nonpartisan initiative that aims to engage Pennsylvania’s voters in a competition to educate citizens about the redistricting process in the state. This is a project of The Committee of Seventy, an independent and nonpartisan advocate for better government in Philadelphia and Pennsylvania. Plans, tools and resources for Draw the Lines PA are still developing. Look for more information Fall 2018. We will support Fair District PA through sharing their materials and publicizing events; support Draw the Lines through sharing and publizing and encouraging branches to hold an event; work with branches to implement redistricting reform activities and events; actively support or oppose legislation. Watch for update with bills introduced in the current General Assembly. Watch Carol Kuniholm’s address to Bucks County Women’s Advocacy Coalition in February 2019. She provides a thorough summary of the issue and update. Like Fair Districts PA on Facebook and follow on Twitter. Join Fair Districts PA to receive email alerts and to locate the FDPA group in your county. Many counties have a group formed and active and Facebook pages of their own. Learn about the issue. Fair Districts PA is the first place to look for information on redistricting reform in Pennsylvania. Click on each menu page for information and resources (bottom of each page). PennLive, WITF and Keystone Crossroads public media stations from across the commonwealth are collaborating on “Over the Line”, a series taking a closer look at redistricting and how it affects communities. Check back often for updates. Ballotpedia provides definitions, history, and an overview of each state. Study the maps of your districts — Pennsylvania House, Pennsylvania Senate, Congressional. Use the interactive maps to see their shapes and how they intersect counties and municipalities. At the bottom of the page, explore the “districts across time” app to see how districts have changed over the years. Another map tool allows you to overlay county, municipal, or school district boundaries. Take action. Under Advocate in the Fair Districts PA Action Toolkit you will find everything you need to contact your legislators, write letters to the editor, and encourage your local town council or county commissioners to pass a resolution. Find out the committee assignments of your Senator and Representative and contact them if on the committee where legislation currently resides. Sign up for updates from Pennsylvania Redistricting–The Legislative Guide to Redistricting in Pennsylvania. Like Draw the Lines PA on Facebook and follow on Twitter. Write an article for your branch newsletter. Make Redistricting Reform a Public Policy priority for your branch. Invite a speaker from Fair Districts PA for a branch meeting or hold a public event. Check out How to Hold an Issue Forum. Erie, Johnstown, and Valley Forge have already done so and would welcome your inquires. Write a letter to the editor. Check out When to Write a Letter to the Editor versus an Op-Ed. Visit every legislator representing branch members. Check out How To Hold a Meeting With Your Elected Officials. For the Senators and Representatives for your members, find out what committees they are on and contact them if on the committee where legislation (see above) currently resides. Send postcards to every legislator representing branch members registering support for legislation (see above).